Provides a better working angle when cutting close to and around the bone. Commonly used with fish or when accuracy is important. The ergonomic, non-slip patented Fibrox Pro handle provides a comfortable grip no matter the size of your hand or where you are gripping the handle. Designed to minimize wrist tension while providing a secure grip, the Fibrox Pro handle is both lightweight and durable, making these knives seem less likes tools and more like an extension of your hand. The textured handle feels secure even when greasy or wet, allowing for precise and effortless cuts every time. Whether a seasoned, or novice home chef, Victorinox Swiss Army offers not only the right tools and the know-how, but most importantly, the confidence to achieve one's culinary aspirations. Expertly crafted in Switzerland since 1884, Victorinox offers a lifetime guarantee against defects in material and workmanship. 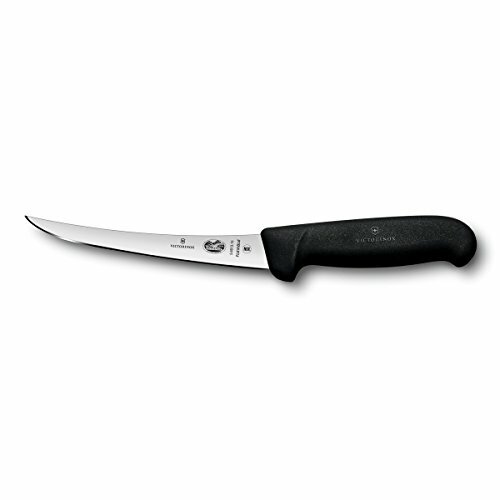 Please NOTE that this item ships with international item number 5.6613.15 on the blade and not 47517 or 40517 but is the same 6" Fibrox Pro Boning Knife.